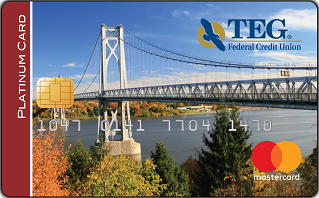 Get the best of both worlds with a credit card from TEG: trustworthy local service and the purchasing power of MasterCard®! With our Platinum credit cards, a low intro rate is just the beginning. Enjoy a special intro rate! We offer two credit card options: a low rate Platinum MasterCard and a low rate Platinum Rewards MasterCard that offers extra perks. Both cards come with the security of MasterCard’s zero liability protection against unauthorized charges and the option to customize your card with a favorite photo or design. With our Platinum Rewards MasterCard, it’s easy to earn great rewards like cash back, travel, merchandise, and gift cards! *APR = Annual Percentage Rate. The introductory fixed rate will be in effect the first six billing cycles after your account is opened. Thereafter, the rate, including the rate on any existing balance, will convert to the applicable Variable Rate determined by applicant’s creditworthiness and card type (Rewards or Low-Rate). Skip-a-Pay available to accounts in good standing only. TEG Payment Assurance available for a fee. Visit www.curewards.com for Reward details. Contact credit union for full details on MasterCard $0 liability. Log into Online Banking, select the tab for Credit Card, then DYOC. Upload an image from a computer, e-mail image from a phone or PDA, or browse the online image catalog. Design your card (resize the selected image; rotate, flip, or add text). Your first custom card design is free. Additional custom card designs cost $9.95 each. Your selected image will be reviewed and approved* by the credit union. Once your custom card is approved, you’ll receive it within 10 to 15 business days. *Some image restrictions apply such as sports team logos, company names, or images that maybe considered offensive– see terms and conditions for full details. Please note that once a Design Your Own Card request is approved on your account, other cardholders on the account need to design their cards the same day if desired to ensure they are not blocked for the specified period. Each Account is allowed to use Design Your Own Card one (1) time every thirty (30) days.